I finished up this little dress for Lauren on Saturday night. I started it two or three weeks ago. 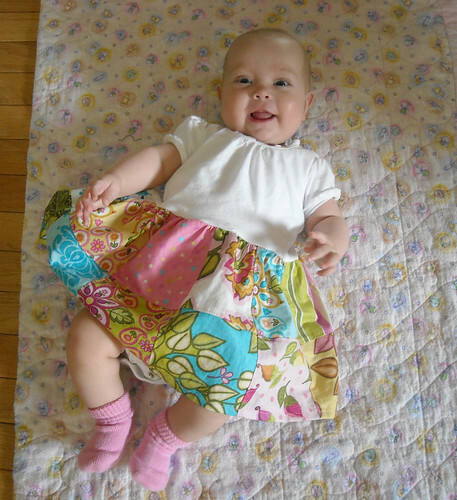 The skirt is made from a Moda Soiree charm pack--20 squares of it for this size dress. It's just sewn to a purchased t-shirt. I really, really like these fabrics. 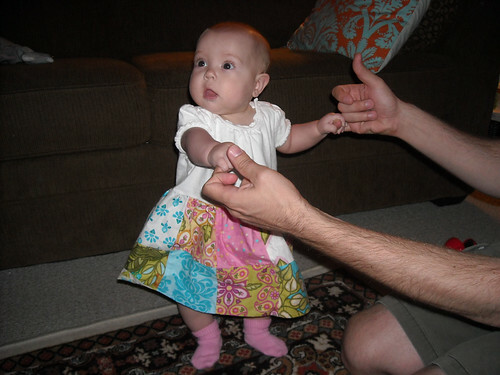 I'm hoping to get some more of my favorites to make another dress or something for Lauren when she's bigger. I love that dress! It is so cute on her and she is adorable! Awww she is so adorable! Love the Moda fabrics, perfect for her. So, so cute! 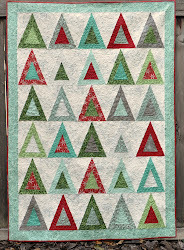 I just bought 4 of the same set...making a pinwheel quilt for my sister's wedding this summer. The fabric is fantastic! So sweet baby :) Love her cute dress... She is adorable!! Did you just make 2 rows of 10 squares each? I have a little niece who would look adorable in a Hello Betty dress!